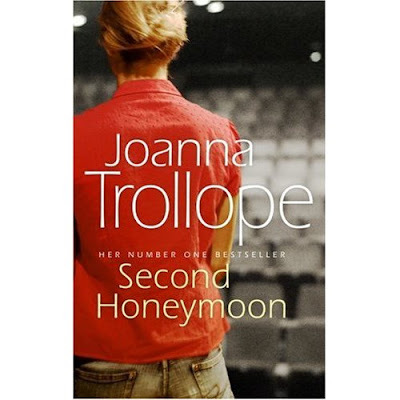 Yesterday I fancied reading something undemanding, and picked up Joanna Trollope's latest book ‘Second Honeymoon’. Actually it sounds rather disparaging to call it ‘undemanding’ as although it was not a difficult read it was by no means the sort of book that some critics refer to patronisingly as “women’s fiction”. Edie, the fifty-plus protagonist is an actress and mother of three grown-up children, the youngest of whom, Ben, has just left home aged 22 to live with his girlfriend. Edie feels totally bereft by his departure and desparately wants him to come back, whereas her husband Russell is looking forward to having her to himself again after so many years. Whilst struggling to come to terms with this new stage of her life, Edie auditions for one of the main roles in an avante-garde production of a play by Ibsen, and to her surprise gets the part. She starts “mothering“ Lazlo the young unknown actor who is playing the part of her son, and as he is in need of somewhere to live, she invites him to lodge with her and Russell. At the same time, her eldest son Matthew breaks up with his financially successful and ambitious girlfriend Ruth, and returns to live at home for a while; no sooner has that happened than her daughter Rosa loses her job, and after a few weeks living with Edie’s sister, she too returns home. Finally Ben her youngest moves back, but as the house is full he has to doss on the sofa. Edie has got what she wanted, her children back under her roof, but it is nothing like she expected to be. They are all adults now, with lives of their own; she becomes increasingly frustrated and exhausted trying to manage her own life in the theatre, and keep the household running with some semblance of order. Slowly she comes to realise that she actually wants to let them go. Trollope is particularly good at the nuances of family relationships and I really empathised with Edie; being of the same age, having one adult child who left home and then after some years has come back to live with us just at the moment when my DH and I were planning to move to a smaller home, I could feel how emotionally torn she was.Two of the most interesting minor characters in the book are Ruth, Matthew’s high flying girlfriend, and Rosa’s best friend Kate who has just had a baby. Trollope cleverly juxtaposes the alpha and omega of motherhood, from the beginning when a baby requires constant mothering, to the stage where the day-to-day care of a mother is no longer needed or wanted, and how hard it is for women to adjust to both stages. A much grittier, more complex book than earlier books by Joanna Trollope, and not an Aga in sight. Churches and Cathedrals should display a big notice on their doors to say that smoking is forbidden in the said Church or Cathedral. Oh, and by the way, this crazy piece of legislation also applies to Synagogues, Hindu Temples, Mosques and other places of religious worship. Why? When did you last see anyone light up a ciggie in church? (or synagogue, temple, mosque etc) Yes, you are correct, you have NEVER seen anyone smoking in church. So why do they need the signs? Jobsworth at the various Local Authorities I asked said " it will be against the law, and so people must be informed" and those responsible for places of religious worship have been told they will be prosecuted if they don't put such signs up. What a weird world Nu Labour has inflicted on us; signs on the doors of churches (cathedrals, temples,, synagogues, mosques etc) telling people that they may not smoke within, WHEN NOBODY EVER DID SO WITHIN LIVING MEMORY. Hang on a minute - murder is against the law and the churches (cathedrals, temples, syn...oh for heavens sake you know the places) do not have big signs on their doors banning murder on the premises. Nor do they have signs listing all the other legal prohibitions that may not take place on the premises; there would be very, very long lists pinned to church doors if they applied the same logic as they have done to the smoking ban. Call me a cynical old bat if you like (but not to my face please), but I sense a job-creation scheme going on; this will create a whole new tier of local council employees all self-righteously checking out that the notices are in place and getting paid for so doing , paid with OUR money. I should just add, that I don't smoke, I don't like being in smoky places, and I hardly ever go to church - but I just think this whole nonsense is symtomatic of a society that is being overly regulated ; and I wish I had shares in some of the companies making mega-bucks from producing all these bloody signs. I have never understood people who use packet cake mixes - so if you are one of them forgive me if I seem rude, but What Is the Point??? I have a girlfriend who always used a pack of Betty Crocker when making her children's birthday cakes, for some reason I was too polite to ask her why she didn't just make a cake in the normal way. A "real" homemade cake takes as little time to make as a packet mix, by the time you've added all the things the manufacturers ask for; and the actual success or failure of the cake will be determined by the oven temperature, timing etc. The chocolate cake recipe below is tried and tested. I must have made it 30-40 times and it is consistantly good. It takes less than 20 minutes to make (not including baking time). So an hour after you have a yen for a choccy cake you can have one, freshly made and iced, how difficult is that? I have made this cake over and over again, for school fetes, for birthdays, anniversaries, sales-of-work, charity sales etc, etc; so when new neighbours moved into the house next door at the weekend, what could be a more perfect welcome presentation than a chocolate cake and a bottle of champers! 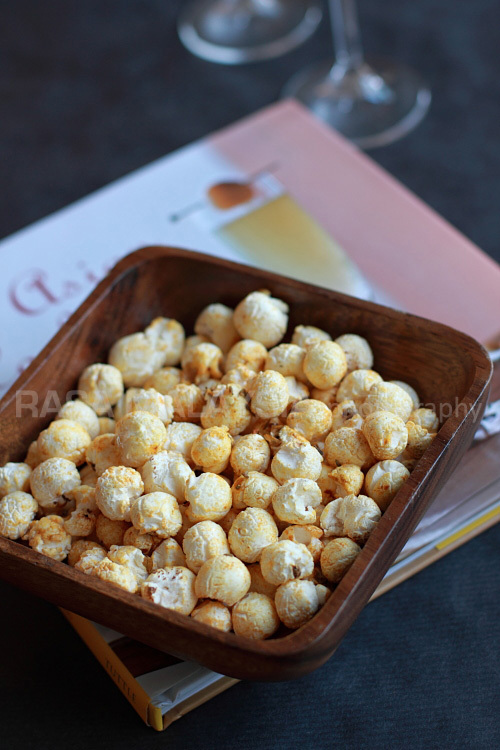 Put the flour, sugar, margarine, both eggs and the baking powder together in a mixing bowl. In a cup mix together the cocoa, coffee and hot water so they become a sloppy paste. Add the cocoa mix to the other ingredients in the mixing bowl. Beat all together with an electric mixer for a minute or so until they are well mixed and of a soft dropping consistency. Divide the cake mix evenly between the two prepared tins, spreading it out so the edges are slightly higher than the centre. Rap each tin on the work surface to remove any large air bubbles, and then bake on the centre shelf of the preheated oven for between 18 -25 minutes until the cakes are shrinking from the sides of the tins, and the centre is firm and slightly springy to touch. Remove from oven and cool on a wire rack whilst making the icing. Sieve the icing sugar and cocoa powder together into a bowl. Put the caster sugar, margarine and water together into a small saucepan, and heat until the sugar is dissolved and the margarine is melted, then bring to a boil, boil for a minute and remove from the heat. Pour the margarine, sugar, water mixture onto the icing sugar and stir together and then beat hard until smooth and beginning to thicken. 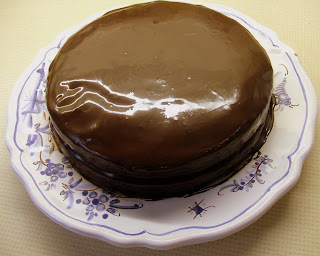 Place one of the cakes on a serving plate (upper side downward) and spread icing over it. Cover with the second cake, and spread the remaining icing evenly over the top. If the icing is firming up too rapidly, dip a knife in hot water and use that to spread it smoothly. Decorate as wished. Thanks - this reminded me of the chocolate cake my late mother used to bake. I baked it too when my children were children. Now inspired to see if I can dig out my cake tins from the back of one of the ktichen cupboards. OMG...that cake! That cake! No, Bybee no! Mustn't lick your computer monitor! Went and bought the book yesterday and have been happily ensconced ever since. Thank you! Ooo that twitterlit thing copied my first lines of books idea. Great more cyber stuff to while away the empty hours. Ex- South African living in London. Married. Adult kids, Mother-in-Law, voracious reader, Dog lover/owner, I pour a mean Gin & Tonic.